Pets are often considered members of the immediate family, particularly in the Bay Area, where more than half of the households at least one animal companion. So it’s no surprise that these pets are getting their very own professional portraits. For those who can afford it, a custom pet portrait is a distinctive way to express your love for your animal companion. Portraits are popular nationwide, but particularly so in the Bay Area, where pet owners spent almost $1.5 billion on pet-related expenses in 2007. Once you’ve decided to immortalize your pet, it’s time to decide which kind of pet portrait to order. There are various types available, including photography; acrylic, oil or watercolor paintings; pastel paintings, which are done in chalk pastels on watercolor paper; and custom paper portraits, which are created using carefully placed handmade papers. Shiu says he gets the most orders for dog portraits and one pet per portrait is more popular than several pets in one piece. Lam agrees. “Most of my orders are for dog portraits, although I paint cats, birds, horses and other animals too,” said Lam, who visits with local clients to meet and photograph their pets before starting to paint. photographs, which you email to them. The process generally takes four to six weeks and costs $250 to $600, depending on the size and type of portrait. Although the type of portrait is an important decision, so too is its placement in your home. Many people hang their custom pet portraits in their living rooms, according to Shiu and Lam. Karen Adams, a dog breeder in Salt Lake City, Ut., ordered a 30-inch-by-30-inch custom oil-on-canvas painting of her Frenchie, Tyrone, from StudioPet, which she hangs in her dining room. Many pet owners, like Adams, order custom portraits as artwork for their home, while others order a portrait as a way to remember lost companions. About 10 to 20 percent of Lam’s clients are ordering a portrait to commemorate a dog that’s passed away. Some also order portraits as gifts for loved ones and their loving creature companions. Shiu says one of the less typical requests he received was from a couple visiting from the U.K. via Las Vegas, where they got married and were honeymooning. Whether you order a custom portrait as a commemoration of a beloved pet or a gift to yourself or others, it’s all about capturing the essence of your pet. 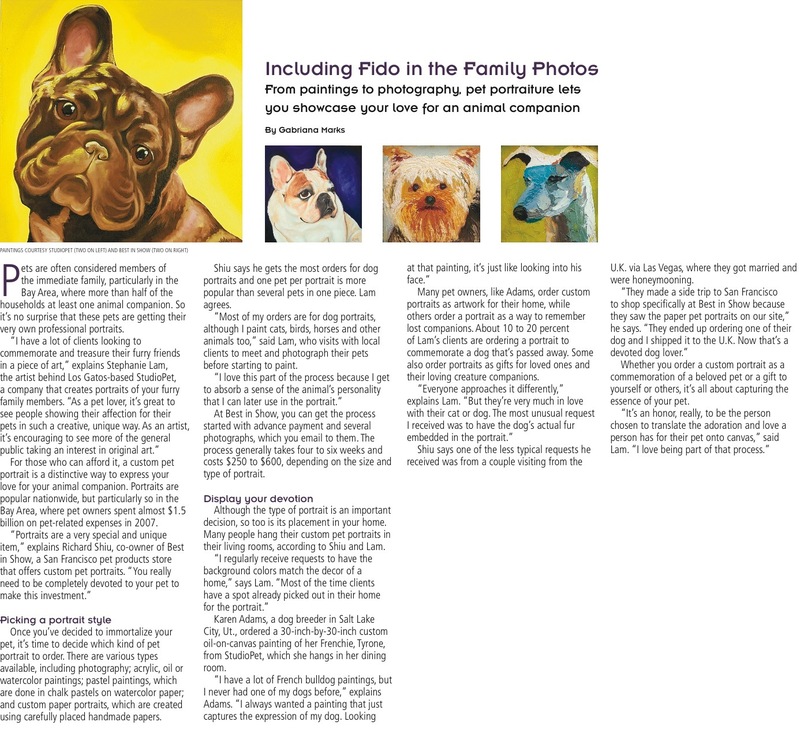 Article published in The San Fransisco Chronicle’s “Pet Guide” custom publication in May 2008. Download PDF of original article to view full layout with PHOTOS!